I am sure that many of you are Allure magazine fans? 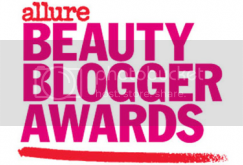 Well, a super sweet blogger and fellow Beauty Blog Coalition member Brooke from Blushing Noir is up for the Allure Beauty Blogger Award. Brooke made it to the top 15! Whoo-hoo! This is a huge deal! Please head on over the Allure and vote for her. :) When you vote, you will be entered to win a trip to Miami! There are other prizes too (spa trip, handbags, etc!). You can vote once a day. So, head on over there and show some love for Brooke! I love the fellow blogger love! Great idea Pam, you inspired me to do the same. Love it! This reminds me that I need to go catch up on your awesome Vlogs too!